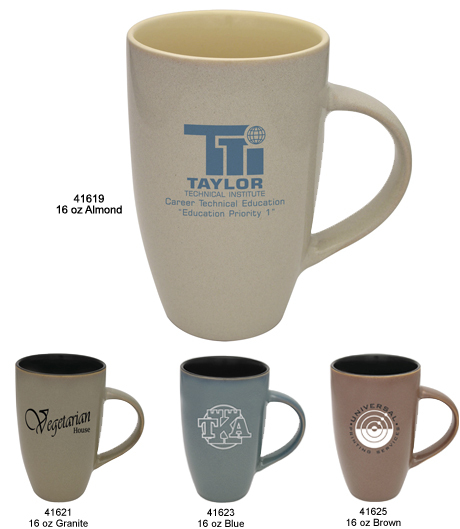 You may order customized coffee mugs with any design, copy, and imprint colors you choose. Our custom-imprinted Tranquil Collection coffee mugs are available in many vibrant colors. We use a kiln-fired imprinting process at up to 1,450 degrees, which ensures that your imprints are durable and long lasting. Your satisfaction is guaranteed when you order Custom Imprinted Mugs from Kardwell International, Inc. Bars, restaurants, clubs, and many other organizations use our mugs. These personalized 16 ounce coffee mugs also make great promotional give-aways. 41619-41625 16 oz Ceramic Coffee Mug 3.28 3.05 2.92 2.83 2.74 2.65 2-1/4" 2-1/4" 7-1/4"